When Keli finds herself a person of interest in the investigation, she begins to wonder if she herself might be cursed. With a little help from her friends, including her devoted boyfriend Wes, Keli aims to find out who poisoned Denise. What she uncovers is a witch’s brew of spells, hexes, and black magic that raises questions about her own Wiccan worldview. 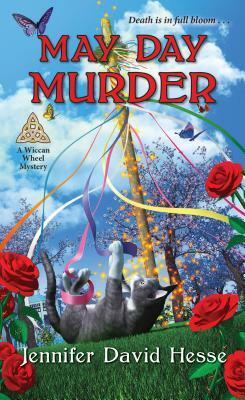 As the community gathers for the May Day festivities, it’s up to Keli to stop a killer from springing ahead to another murder . . .
Jennifer David Hesse is an environmental attorney by day and author by night. Born and raised in Central Illinois, Jennifer now makes her home in Chicago with her husband, guitarist Scott Hesse, and their daughter, Sage. When she’s not writing, Jennifer enjoys yoga, hiking, and movie night with her family. Please visit her at www.JenniferDavidHesse.com or on Facebook at facebook.com/AuthorJenniferDavidHesse.